In today’s modern age of constant climate change warnings, many people are trying to live greener lives by cutting down on fossil fuel consumption and being considerate towards the environment. This extends to the home sphere, as there are now numerous methods to create a home which is environmentally friendly as well as aesthetically appealing. Here are some of the ways you can create a greener home. 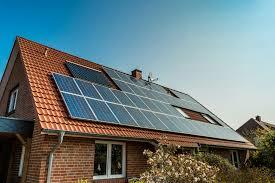 With falling costs, solar panels are becoming much more common as an addition to the regular house. They can be used to heat water and generate electricity, and some of the electricity can be sold to the national grid. These can be a great long-term investment, as the savings you make are likely to eventually pay for the panels themselves. Once you have installed them, you can be sure that your house will be far greener as a result of their energy efficiency. You might also want to check out Frameless Solar Panels and Free Standing Solar Panels. Another way to create/make a greener home is to use materials which have little or no carbon footprint, or come from environmentally friendly sources. Whether its glass balustrades or wooden doors, there is usually an environmentally friendly option when you are choosing materials to use. This can, of course, turn out to be more expensive, as these types of products are often in shorter supply. That being said, spending that little bit extra to get quality, green materials will go a long way in reducing the carbon footprint of your house, and could prove to be a unique selling point to a potential buyer. One of the more common ways to make a greener home is to add double glazed windows. These are thick, and trap heat in the house, reducing heating costs and keeping it warm for longer. It is important to know which type of glass you want and how thick it is, as this will determine the extent to which double glazed windows save you money and energy. The best energy rating on the Window Energy Rating system is A+, whilst the worst is G, so be sure to look out for the rating on your windows. There are much more ways to create energy efficient homes, such as adding underfloor heating and draft proofing. Ultimately, the more ways you can find to reduce energy use and keep your house green, the more money you will save in the long run. A very good Para on Greener Home by Mr. Andre Jackson…..! !